Roll and Write games have been enjoying a quiet wave of popularity recently. Roll and Writes are simply games where you roll some dice, then write something down based on the results. Yahtzee is the most well known of the genre, and designers have expanded on the simple idea of dice probabilities to create games where your decisions feel like they matter. I tend to shy away from games where rolling dice is the main mechanic, and I have always been skeptical of the decision making present in these games, but I go into this with an open mind. I’ve taken an interested in this style of game because some of them would play well on my Twitch stream, providing a fun and interactive way for chat to participate! Qwixx is the simplest of the 3 roll and writes I’ll be discussing. The goal is check off numbers across 4 different colored rows. The more numbers you check off per color, the more points you get. The kicker? Once you check off a number, you cannot check off ANY numbers to the left. 2 rows go from 2-12 and the other 2 rows go from 12-2. On your turn, you roll 2 white dice and 4 colored dice. Every player has a choice to mark off the total number on the white dice, then the active player gets a chance to add 1 white die to 1 of the colored die and mark off that color. If the active player chooses to do neither of these, she takes a 5 point penalty. The game ends when one player takes 4 penalties or 2 rows become locked. Players can lock a row if they have at least 5 Xs in the row prior to marking off the last number (2 or 12, depending on color). Once a color is locked, that die is removed from the game. Qwixx is mostly based on probability and gets quicker and easier as the choices narrow. There is no way to manipulate the rolls, and there are some interesting choices at the start of the game based on what color to fill in to try to lock dice quickly. We played incorrectly the first few rolls, thinking that all players also got an opportunity to mark down the chosen color roll. This led to some interesting choices and brought a level of “screw you” to the game, as it made for opportunities to force another player to take the 5 point penalty. This is an interesting variant I may try again. Will it play on stream? Yes! As a two player game of Me vs Chat, anyone in chat would share the same white dice total when it is “their” turn, but have an individual choice on which white die to pair with a colored die. 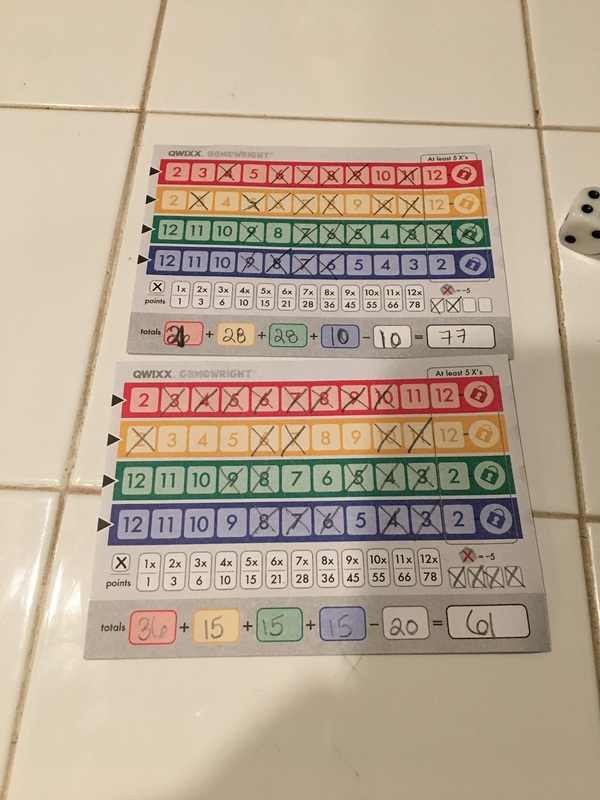 Download a Qwixx scorecard from Board Game Geek. There are rules to off to write down numbers on states. First, You must write a number if possible. If not possible, write an X Second, the color of the state has to match the color of the die Third, the number rolled has to be within 1 of all neighboring states. The game also provides you with 3 seemingly simple additional options to mitigate dice rolls. Pretty self explanatory. Don’t want that Purple 5? Change it to an Orange 5 instead! Another easy one. You can use the same die again in 1 turn. Need two Red 3s? You got ’em! Dupe is especially interesting with the Wild Die since you can pick a new color. Guard is the most powerful of the 3 abilities. If you Guard a number, you circle it when played. This number is immune to the all states must be within 1 number placement rule. Put that 5 next to a 2 and circle it! Players can use each option 3 times. At any time you can’t place a number, put an X in a state of that color. The player with the fewest Xs wins. Will it play on stream? Yes! All placement is simultaneous and there is no “active player”. 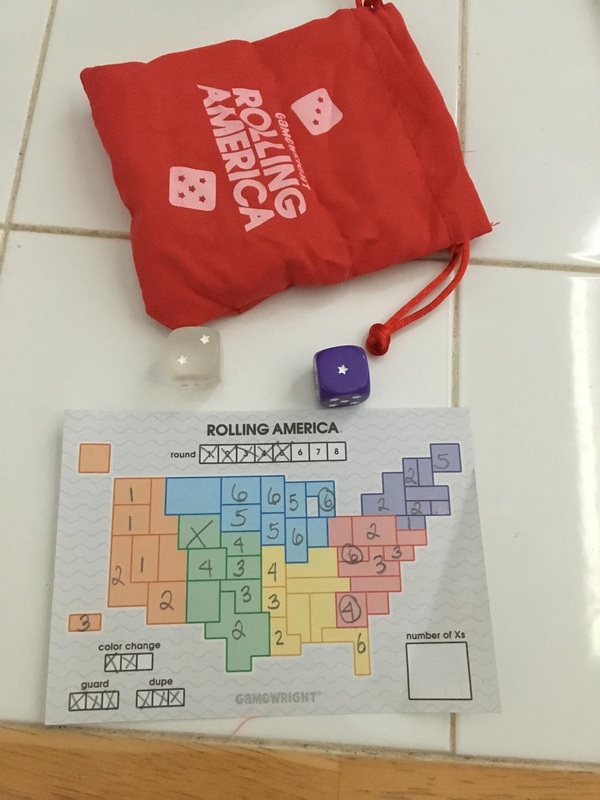 Rolling America could easily be played with Chat marking off their individual maps every roll. 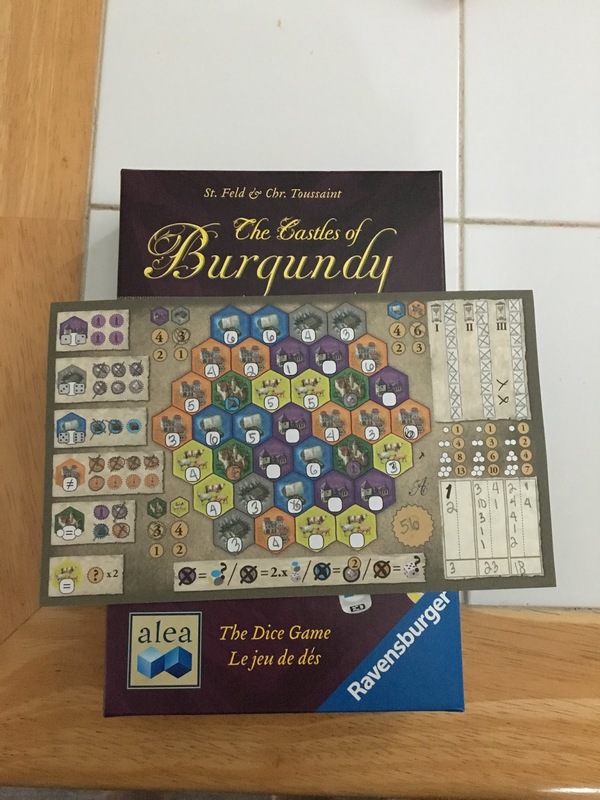 Based on Stefan Feld’s hit Euro smash Castles of Burgundy, Castles of Burgundy: The Dice Game (that’s a mouthful!) is the best of the bunch. Similar to the board game it’s based on, the dice game offers a wide variety of decisions with every dice roll AND the ability to manipulate the dice. There are the same tense decisions of filling in different areas for bonus point faster than your opponents can that sets this apart from Qwixx or Rolling America. A Time Die depicting a 1 or 2 hour glass symbol is rolled every turn with the rest of the dice. There are 3 rounds consisting of 10 time marks each. The quicker you complete an area, the more points you receive. The game ends when the last time mark is checked. Players have an immediate choice at the start of the game by selecting a starting Castle location. Right off the bat, players can pursue different strategies since each Castle grants you a different special action. The starting Castle is also crucial because, like in the board game, you can only build next to an already built location. Technologies have been replaced by Monasteries but the other locations stay true to the board game. Each location has a unique twist, and each each completed area grants a special action that can be used to manipulate future rolls. Castles: gain either a Monk, Silver, Goods or Worker. Pastures: points for finishing a Pasture area are doubled. There are restrictions on how you can build on a space. Managing these restrictions form the heart of the game, but the restrictions takes some time to get used to. Despite being a dice roller, Castles of Burgundy: The Dice Game offers a dizzying amount of choices. What areas should you try to complete first? What special actions are the most important for your strategy? Do you keep your options open or go for points early while risking future turns? How do I best use the special actions I’ve earned to get the most points? A true Euro style game, the player with the most points at the end of 3 rounds wins! It is a very satisfying dice puzzle. All 3 of these Roll and Write games could be streamed and enjoyed with chat. The only challenge is anyone who wants to play in chat will need their own personal board to mark on. Qwixx has the simplest board to recreate, while Castles of Burgundy: The Dice Game easily has the most complex. Thankfully, there are fan made redesigns available to download on Board Game Geek. Chat will have to get creative and make a home made map for Rolling America.